It’s not often that baby carriages mingle with the wheelchairs and walkers in the retired sisters’ dining room. 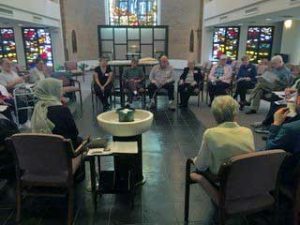 But such was the case one Saturday in February, when a group of Catholics and Muslims met at St. Dominic Villa for their monthly gathering. Two of the members had had babies in the last year, and they brought their infants to the meeting. The group consists of parishioners from All Saints Catholic Church in Houston and Muslim men and women from Turkey. They came together a couple of years ago in order to foster understanding between Christians and Muslims. Each month, they meet in a home. After a shared meal, they discuss a passage from the Hebrew Scriptures (Old Testament), the Christian Scriptures (New Testament), and the Koran. Generally, the passages are parallel in content. The degree of similarity in the texts is often striking, yielding valuable insights. For instance, in the February gathering, the passages concerned Cain’s killing of his brother Abel. One of the Muslim participants observed that, although the incident is recounted in the Koran, the brothers’ names are not given. The meeting could hardly have been more timely, coming as it did just days after Pope Francis and the Grand Imam of Al-Azhar, Ahmed el-Tayeb, signed a Document on Human Fraternity for World Peace and Living Together in Abu Dhabi. Because the usual meeting place at the Villa is being renovated, the group gathered for discussion in the chapel—a happy accident. The group expressed a feeling of awe on entering the sacred space.